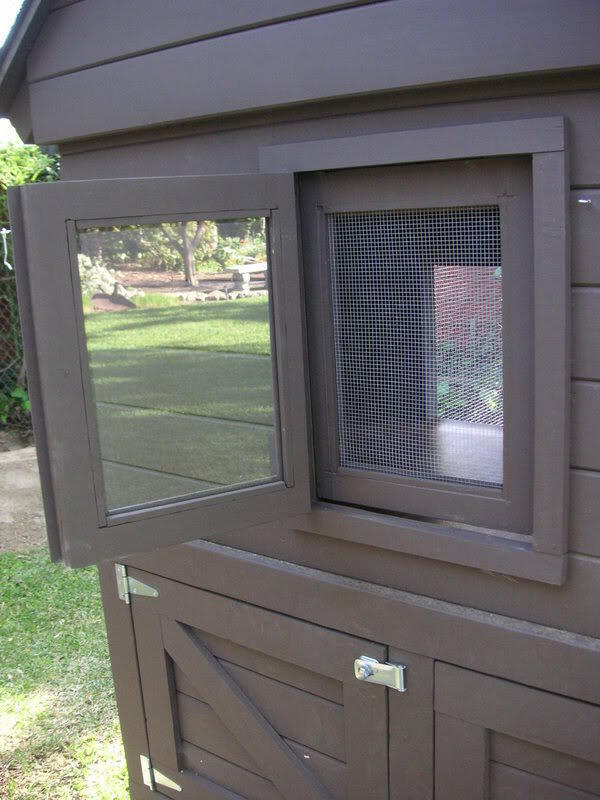 A beautifully perfect "all in one" coop built it to house three to five chickens. 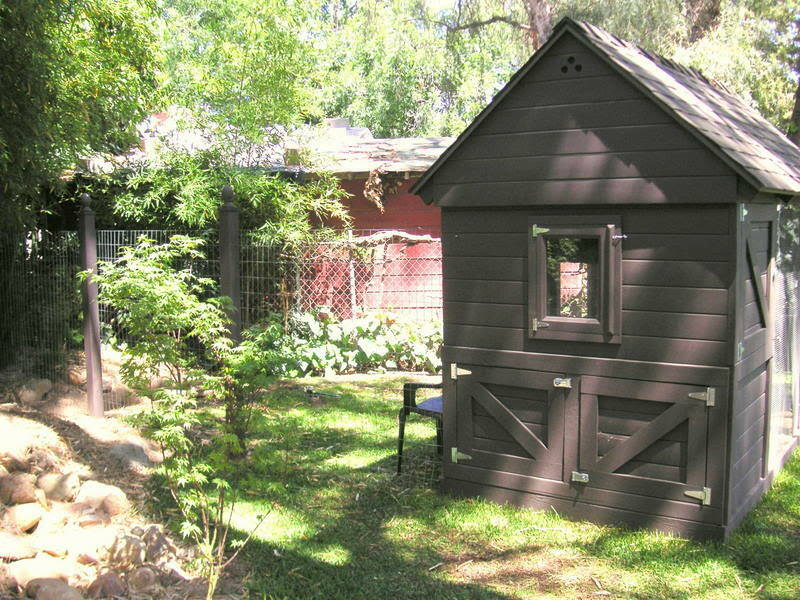 Mike and I built our first chicken coop in March 2008, here in Southern California. 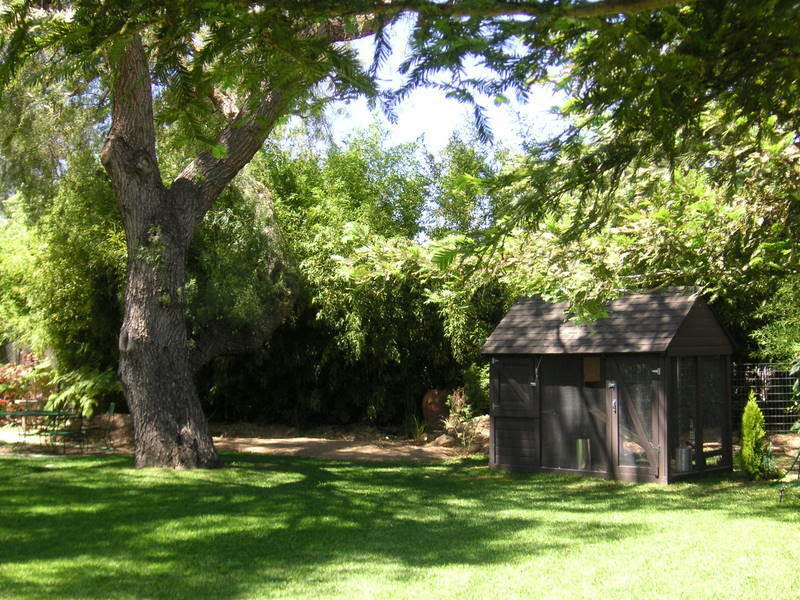 Overall, it is 5x10' with a 3x5' henhouse and a 5x7' covered run. We built it to house three to five chickens. It is designed to blend with the other buildings on the property and to improve our garden's appearance (it's made out of better materials than our house!). Our thanks go to both the BYC crew and Monica for wonderful ideas on how to build coops. Next, we put polyurethaned OSB flooring in both henhouse and storage areas (each required a full sheet, boo hoo). 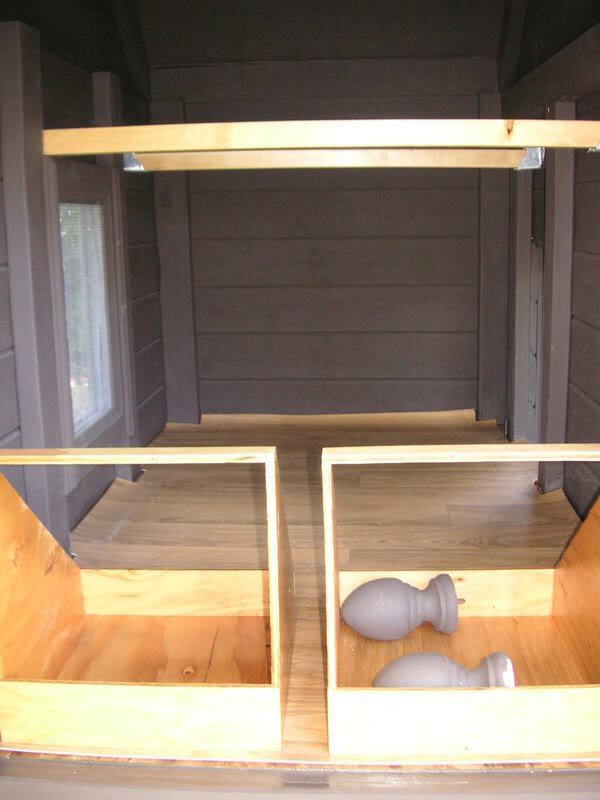 We framed for the window and the pophole in the henhouse, and the doors for the storage area. 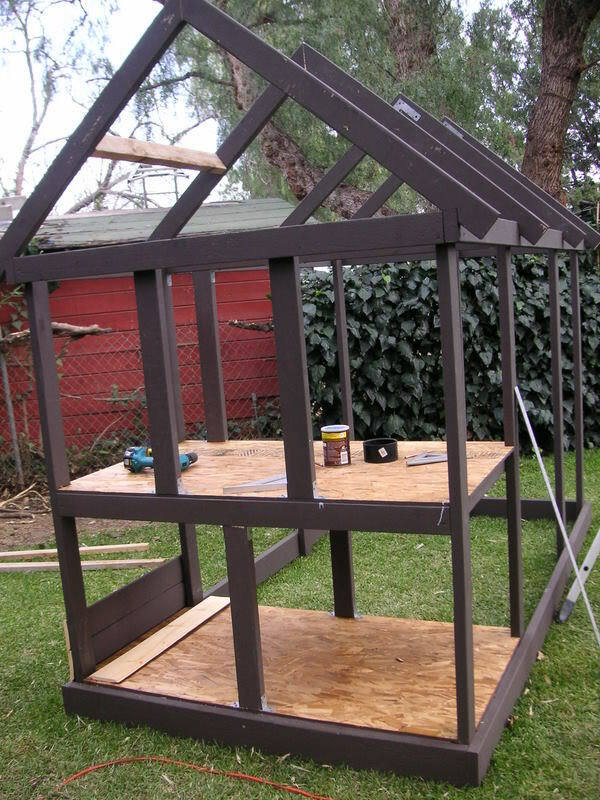 We added the roof joists and stabilizing cross pieces. 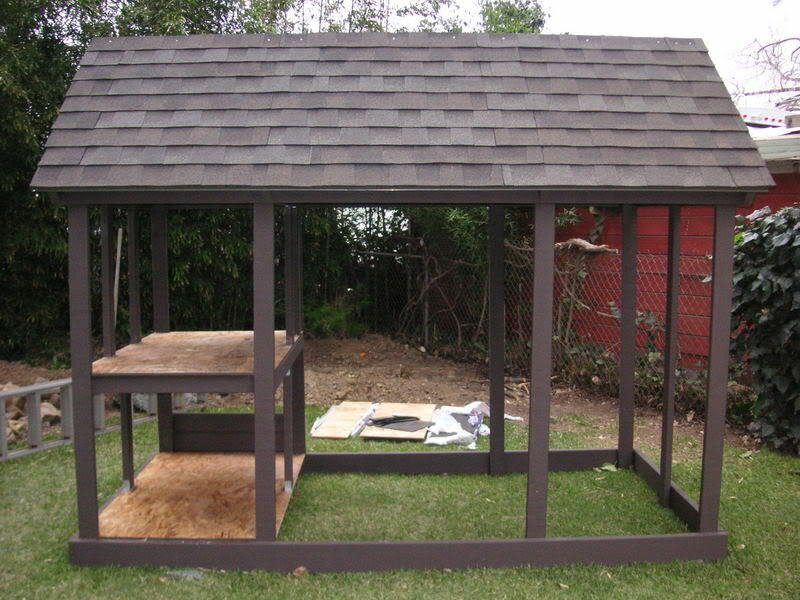 We roofed La Cage Mahal with 7/16" OSB, metal drip edging, tar paper, then asphalt shingles and cap. The very short roofing nails were just a hair too long. I recommend thicker OSB or plywood. The siding is 1x6" shiplap. We should have attached it to the ends of the coop BEFORE we put the roof on, so that we could draw the angle easily with a pencil, rather than getting out the protractor and trying to calculate the angle mathematically! We built the doors for the storage area and the henhouse out of 1x6" shiplap cut to the size of the opening, then we screwed scrap lumber to the back to hold it together, then we used 1x4" pine to frame the door edge and to make the diagonal cross pieces. 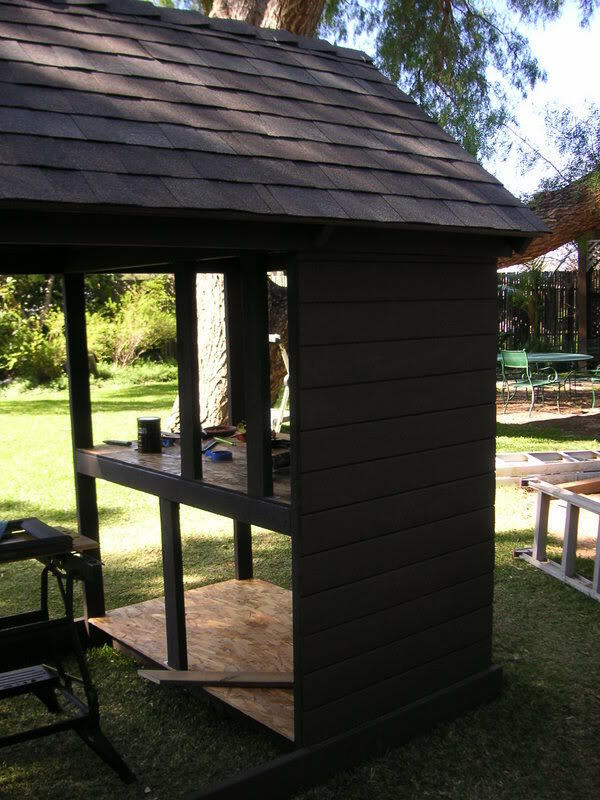 We hung them with galvanized exterior hinges and fastened them with hasps. The window came from an old cabinet. We just painted it and hung it. We used the other window from the same cabinet to make a fixed screen door that is fastened to the frame. 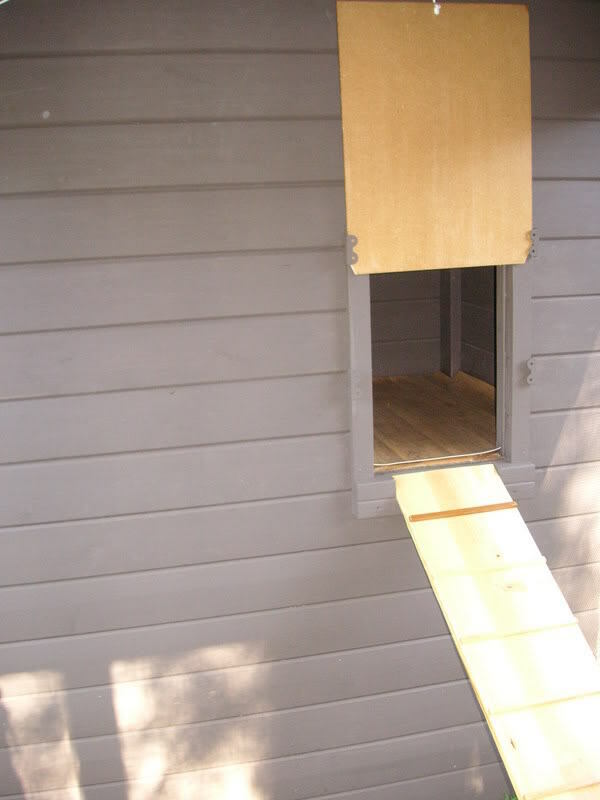 The screen doors were constructed by sandwiching hardware cloth between two overlapping 1x4" frames, then placing another 1x4 diagonally across the face for stability. The hardware cloth enclosing the run area was nailed to the outside of the frame, then another 2x4 was placed over the nails, sandwiching it to secure against predators (including Sam, our new dog). 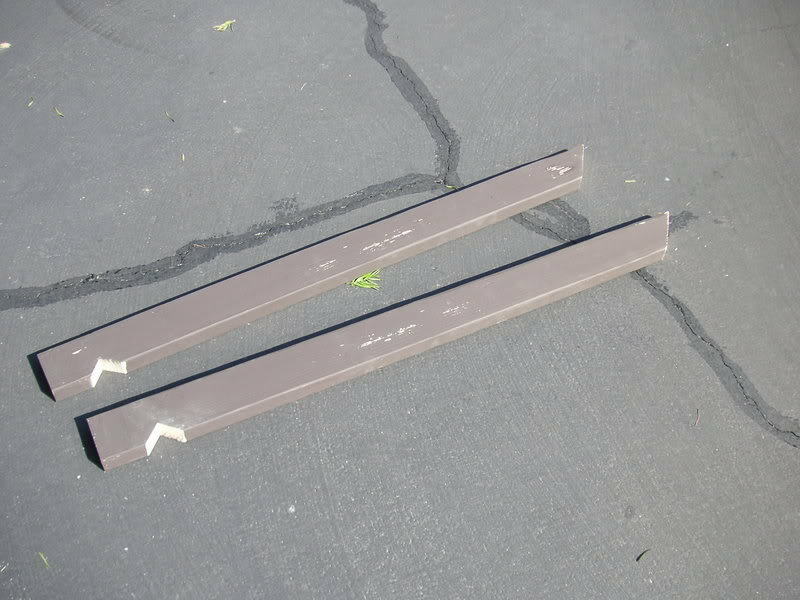 We will line the bottom of the run with attached, welded wire when the babies are allowed out. The ladder is made of 1x10 pine with 1/2" square dowels nailed to the top and a 2x2" nailed to the underside for stability. I think it is too long, and we might replace it with a step ladder. 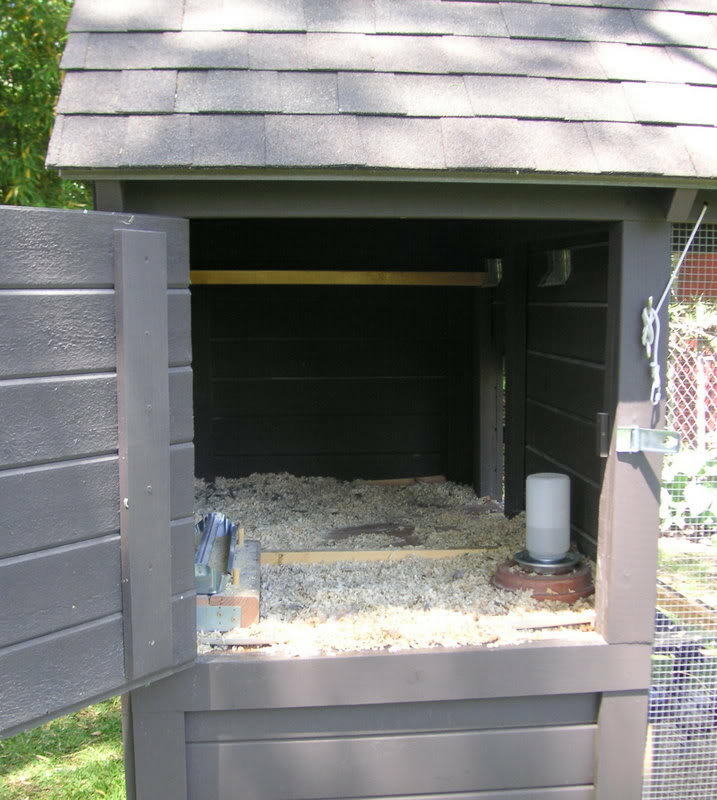 The pophole has a sliding door made of melamine and it opens from outside the coop with a rope and pulley. Ahem. Did I say three to five chickens? 1. Shortened chicken ramp so that we can get into the run! 2. Moved nest boxes to back of henhouse and roosts to front for easier poop-scooping. 3. Made folding fence of left-over wire and wood. 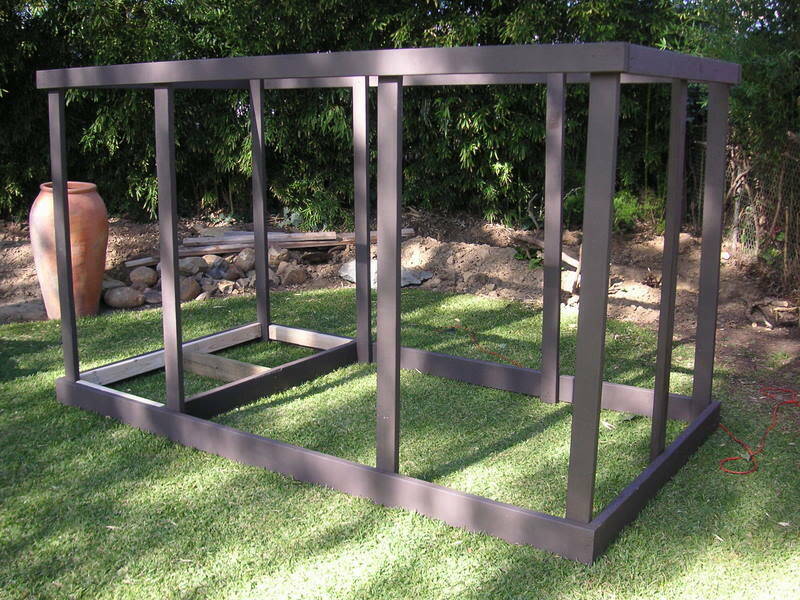 Each panel is 3x5, hinged together. We can now grow grass and other forage in a section of the Chicken Yard. 4. Made a "screen door" for the pop hole to increase air flow in the summer. 5. 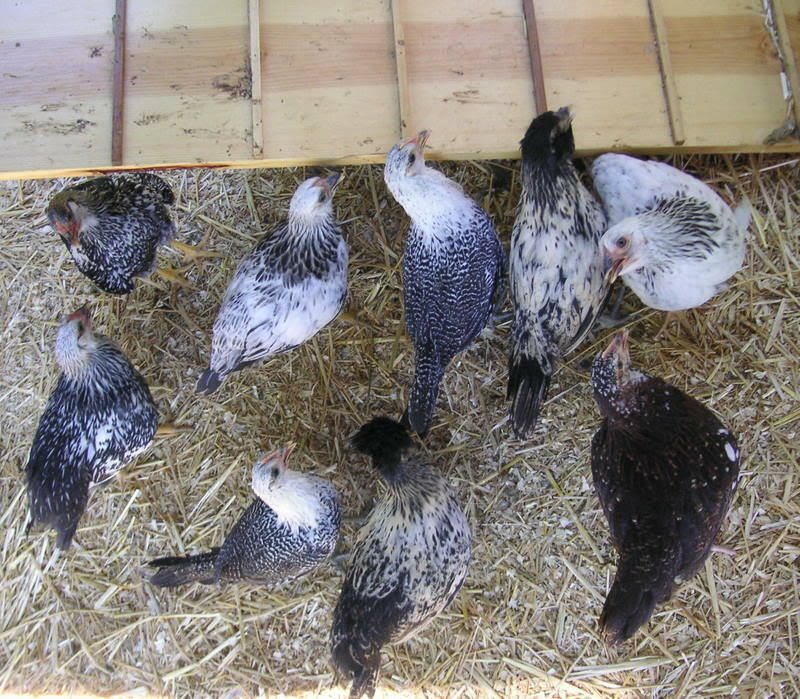 Eliminated pine shavings in hen house and replaced shavings and straw in run with sand. 6. Gave ten chickens to brother-in-law. The space is just right for four chickens. I apologize to all for incorrect construction terms and vocabulary. I hope you can understand the meaning of my terms through context. We splurged on shiplap siding, Dunn Edwards paint, and asphalt roofing shingles. 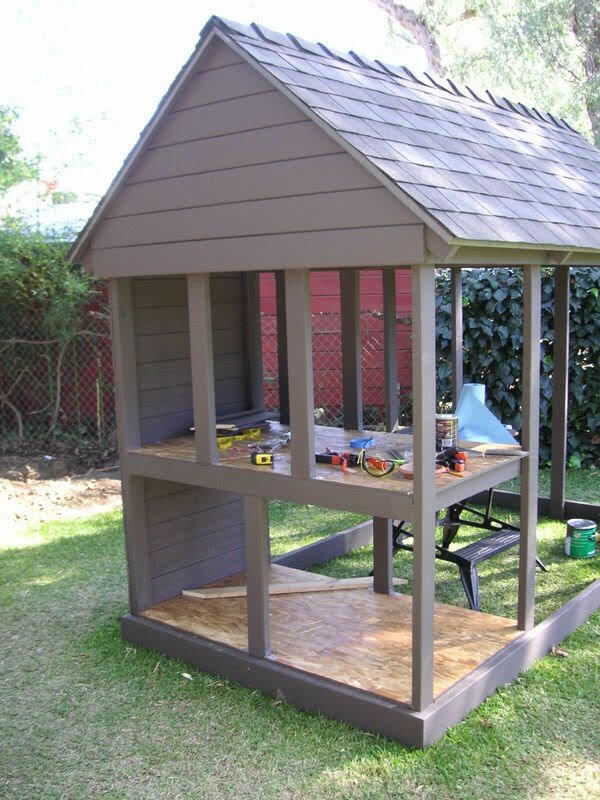 The materials were purchased, for the most part, from Home Depot in February and March of 2008. Love the setup. And awesome job with the list to help people see what they may need and the cost of it all. Thank you for sharing! Very nice and a good presentation as well. 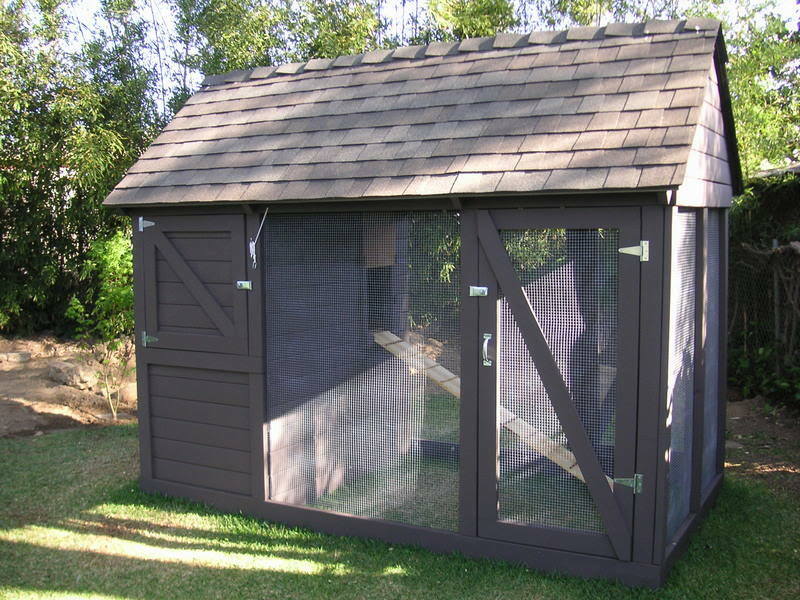 Fantastic looking coop - I really like the built in storage. 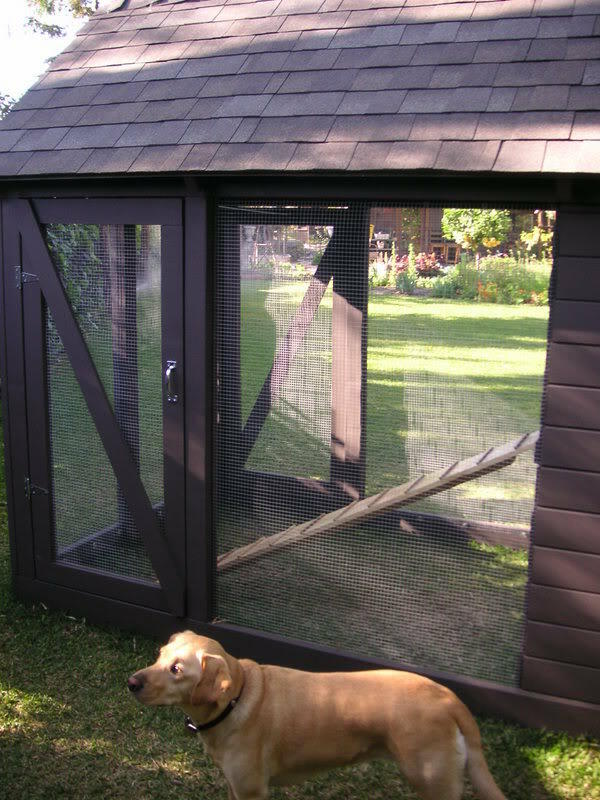 This coop reminds me of a pull it coop that I have seen on a manufacturers website called a pull-it coop. I think it was Horizon Structures. 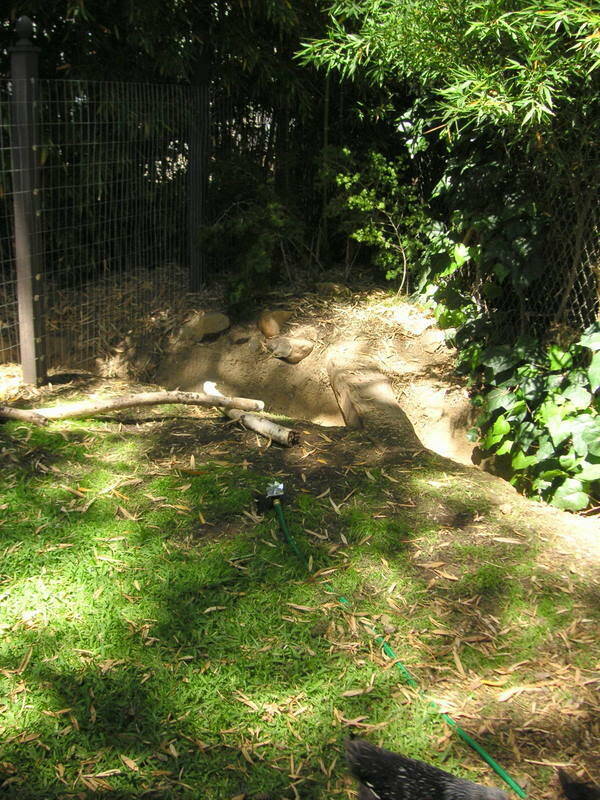 You coop appears to be very predator proof. 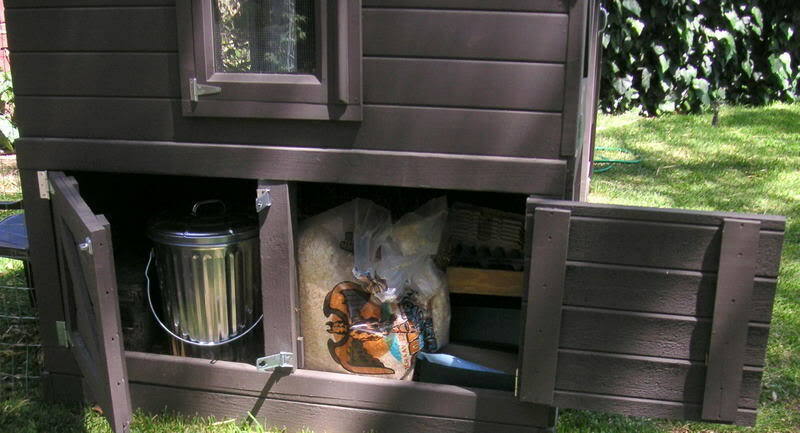 I like the storage underneath for food etc. I know you showed 9 birds i think in the photo but how many do you plan to have when all is said and done? Hello. Yes, that looks fabulous. How many chickens will it hold comfortably. I wish I could have hens in my city. Just as side note: how easy is it to keep clean? Are you in a city or large town? What of the smell factor? Thanks. I am just studying getting started with chicken. My favorite part is the chicken bridge! Beautiful yard and coop-kudos to you for all your effort. What a great-looking coop! Thanks for sharing! I like the storage area underneath.